In discussing the platform of Collective Action some individuals have expressed confusion at our use of the label “specifism” to describe the tradition of social anarchism we associate with. The following is a short introduction to what we consider to be the most essential concepts within the specifist model…. In discussing the platform of Collective Action some individuals have expressed confusion at our use of the label “specifism” to describe the tradition of social anarchism we associate with. The following is a short introduction to what we consider to be the most essential concepts within the specifist model. This text is an adaptation of a forthcoming interview with Shift Magazine on anti-capitalist regroupment. “Specifism” refers to an organisationalist current within the anarchist tradition which, in contemporary terms, is principally elaborated by the Federação Anarquista do Rio de Janeiro (FARJ) but has its historical roots in the writings of Bakunin, Malatesta and Makhno (among others). 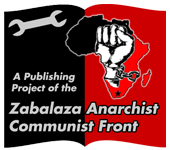 Many associate these ideas solely with Makhno’s “Organisational Platform of the General Union of Anarchists (Draft)” but they actually date from one of the first organisational documents of social anarchism – Bakunin’s programme for the International Alliance of Socialist Democracy. At the core of the specifist framework is an understanding of the division of anarchist activity into the social and political level. Specifists argue that a lot of the organisational errors of anarchist militants result from a confusion of the social and political level. The social level is understood as those struggles that exist within the material and ideological framework of capitalism (bread-and-butter issues in layman terms). These will be heavily determined by the ideology of capitalist society and situated principally within the logic of capitalism, for example the demand for increased wages in exchange for labour or the desire for social reforms from the state. These will also be structured by a wider cultural, economic and political framework that will both shape their character, as well as causing their level of combativity and consciousness to ebb and flow, one example being the way in which the ongoing financial crisis has provoked an acceleration of working class resistance in certain sectors and geographical areas. Anarchists need to find a way of engaging with these struggles in a way that relates directly to the existing composition and level of consciousness present within the class. Successful engagement requires both a relationship of study, in terms of the need to understand and critically evaluate the existing composition and ideas of the class, and a relationship of intervention, to practically shape anarchist ideas and methods so they appear as sensible and useful tools for those engaged at the social level. Anarchists also need to maintain their own coherent vision of an alternative society – anarchist communism. This is the political level. The political level represents the idea (theory) expressed by revolutionary minorities as visions for social transformation and alternative societies. This political line is obviously not static and exists relationally to the social level. The political level cannot be purely the expression of propaganda of the ideal. Anarchist communism is a tradition developed from the lessons drawn from the struggles of the popular classes. Work at the political level is cultivated through the study, self-criticism and organisational activity of anarchist communist militants and expressed through the unity and organisational discipline of the specific anarchist organisation (SAO). While the social level acts at as the “compass”, as Magon puts is, that steers the theory of revolutionary militants, the political level is also distinct from the social level in that the ideas here are held irrespective of the general social framework and therefore not subject to the mediations of capitalism and the state. The political level, therefore, while expressing clarity in revolutionary ideas does this in the form of minority organisations that are independent and not representative of those held by the class-as-a-whole. What results from this understanding of the political and social levels is the practice of “organisational dualism”. Specifically anarchist groups (hence the term “specifism”) with well defined positions of principle and operating under conditions of political unity at the political level intervene, participate within or seek to build popular movements at the social level. The objective of this intervention is not to “capture” or establish anarchist fronts but to create the correct conditions, by arguing for anarchist methods and ideas, for the flourishing of working class autonomy. It is this autonomy that is the basis for working class counter-power and revolutionary change, as Malatesta (1897) famously stated, “We anarchists do not want to emancipate the people; we want the people to emancipate themselves”. As the Federazione dei Comunisti Anarchici (FdCA) (2005) argue, work at the social level should not be a carbon copy of the organisations of the political level. Intervention at the social level has to arise within the context of the immediate needs of the proletariat and their current state of ideological and technical composition. In this sense work at the social level intervenes within and aims to accelerate the process of, as Marx expressed it, the class acting “in itself”, subject to a common condition under capitalism, towards a class-for-itself, a self-conscious grouping acting to its own material interests – communism. Specifism is a praxis that seeks to strike the balance between a healthy relationship of influence within the class and an ideologically coherent communist organisation, while rejecting the vanguardist approaches of Leninist groups. Whereas Marxists will traditionally look to the fluctuating struggles of the social level and argue the need for a revolutionary leadership from without, specifists argue that anarchist communists fight by acting as a critical conscience from within. For this reason specifism is fundamentally organisationalist in character rejecting the idea that anarchism can be developed purely through the propagandistic activity of discussion circles, groups or federations. Rather the SAO needs to form unified tactics and a strategy as the basis of its programme that it carries through in its activity within the class. Specifism represents both an alternative to anarchist activism, which does not compose itself formally at the political level, and certain models of anarcho-syndicalism, which attempt to unify the practice of the social and political level in the formation of revolutionary unions. In criticism of anarchist activism, specifists stress the need for an educated and self-critical practice at the political level to build sustainable long-term interventions at the social level. The alternative is sporadic, reactive political work that doesn’t incorporate a cycle of review and re-evaluation. Likewise, as Fabbri notes, the lack of “visible organisations” on the part of anarchist militants, i.e. clear and accessible lines of participation, creates space for the “establishment of arbitrary, less libertarian organisations”. In response to anarcho-syndicalism, specifists argue that the formation of social-level organisations – unions – with revolutionary principles, does not resolve the problems created by capitalist mediation at the social level. Rather, as the FdCA argue, what result often is, “a strange mix of mass organisation and political organisation which is basically an organisation of anarchists who set themselves up to do union work”. This situation usually resolves either in the actual existence of a revolutionary minority within the union itself that seeks to preserve the line in the face of fluctuations at the social level, often being forced to act undemocratically or necessarily preserving a minority membership for the union, or a flexibility in anarchist principles which leaves open the question of where the radicalisation between the political and social level will occur. Likewise the FARJ make a historical point that the dissolution of anarchist activity into the social level has meant in many cases the complete loss of any political reference point following the collapse or repression of these organisations. The SAO, in this sense, can act as a vital line of continuity for anarchist communist ideas. Collective Action argues that the lessons and guides derived from specifist theory are a critical tool in the process of anarchist regroupment. The only way there can be a future for anarchist politics in the UK in the 21st Century is in making anarchist communist ideas and methods a practical and coherent tool for organising workplaces, intervening in social struggles and empowering working class communities. Anarchism needs to recapture its traditional terrain of organising, what Bakunin referred to as, the “popular classes” and abandon the dead-end of activism. This means a fundamental re-assessment of what we do and what we hope to achieve. It also means returning, as Vaneigem would call it, to the politics of “everyday life”. This means reorientation of our practice to both the social and political level and utilising the richness of our own political tradition to clarify and improve our own organising efforts. A certain elasticity must be allowed with these terms and the labels should by no means be considered exclusive. The “social” level, for example, is of course at the same time “political” in that it is a sphere for both the contestation and birth of ideas. Likewise the “political” level is simultaneously “social” in respect to the fact that anarchist communist ideas are derived from a historical and materialist analysis of society, and composed of the experiences and lessons of social struggle (for more commentary on the historical materialist character of anarchist communism see “Appendix 1: Historical Materialism and Dialectical Materialism” In: Federazione dei Communisti Anarchici (2005) Anarchist Communists: A Question of Class. Studies for a Libertarian Alternative: FdCA).